Zimbabwe‘s president, Robert Mugabe, is enjoying a surge of popularity that could propel him to victory in the country’s next elections, an independent poll of voters’ intentions suggests. Mugabe would command the support of 31% of voters in a presidential election, ahead of rival Morgan Tsvangirai on 19%, according to research for the US-based pro-democracy group Freedom House. Tsvangirai’s Movement for Democratic Change (MDC) dismissed the results, noting that Mugabe’s supporters were outnumbered by voters who refused to declare their intentions. 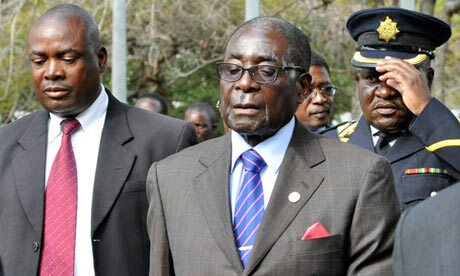 But it is likely to boost the confidence of Mugabe’s Zanu-PF party heading into elections expected next year. The Mass Public Opinion Institute polled a nationally representative sample of 1,198 adult Zimbabweans between 23 June and 7 July 2012, Freedom House said. When asked who they would vote for if presidential elections were held tomorrow, 31% say they would back Zanu-PF, an increase from just 12% in a 2009 survey. Alarmingly for the MDC, only 19% expressed support for the party, a dramatic fall from 55% three years ago. Other parties registered just 2%. However, some 40% of respondents did not declare their voting intentions, making it hard to draw categorical conclusions. Asked who they would support in parliamentary elections, 47% of respondents said they would not vote, or refused to indicate who they would vote for. Some 20% said they would support the MDC (down from 38% in 2010) and 31% would back Zanu-PF (up from 17% in 2010). The results come as a surprise because for years there has been a near default assumption by the MDC, activists and media that Mugabe’s 32-year rule was drained of popular support and is sustained only by rigged elections and violence and intimidation. Freedom House’s survey implies that the 88-year-old could yet make a political comeback and win. It also resonates with signs of discontent about the MDC’s performance in the unity government it formed with Zanu-PF following the disputed election of 2008. The MDC took responsibility for departments such as education and health and has been criticised for slow delivery. Some observers argue that MDC ministers have fallen in love with their official cars and other trappings of power. Susan Booysen, author of the interim report Change and ‘New’ Politics in Zimbabwe for Freedom House, said she encountered complaints that the MDC had lost touch with grassroots constituencies, whereas Zanu-PF was still visible and fighting party political battles there. The MDC questioned the validity of the study. Douglas Mwonzora, the party spokesperson, said in Harare: “The party respects the right of individuals and institutions to carry out opinion surveys on the views of the people of Zimbabwe from time to time. However, we note that surveys carried out under current conditions are difficult to rely on due to the fact that they are held under conditions of major fluidity.